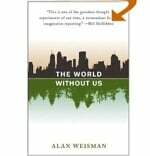 Book Review: The World Without Us By Alan Weisman. In what was one of the best books I have read in a while, Alan Weisman takes the reader on a journey to the future (which I suppose could happen anytime) when humans are no longer on the planet – and the devastation and growth that happens simultaneously in the fallout. The World Without Us explores what will happen when we are no longer here to maintain what we have built…and how the animals and fauna will start taking back the planet almost immediately upon our demise. Whether it be from an asteroid, a nuclear war or some pandemic, Weisman talks about the worst case scenario for us, that we disappear immediately. What would be a pretty bad experience for us humans would benefit the planet immensely – after it cleaned up our mess. Between the nuclear plants melting down, skyscrapers collapsing into the Atlantic Ocean where Manhattan once reigned, subways filling with water, or damns giving way, it is going to be one wild ride once we disappear. It is amazing tale about the world itself as well as an exploration of what we humans have created on this planet, and if it doesn’t make you start thinking about your true place in the world, then you are not paying attention. Weisman takes turns going back and forth between the future and today, and along the way talks about various conditions around the world that are causing damage to our planet. For example, he talks about the floating plastic debris field in the middle of the Pacific Ocean called the North Pacific Subtropical Gyre, which is basically a circular graveyard where all of our plastic ends up. That single cup you let float into the ocean ends up here, along with another 18 million tons of plastic. Yes, we have created a virtual island out of plastic in the Pacific Ocean…maybe DiCaprio can turn it into an eco-resort or something! The next time you think the earth is in danger, think again – as I have written before, the earth will take care of itself…by getting rid of us and all that we have done to it. This book is an incredible adventure through the aftermath, and The World Without Us is definitely worth a read or two. I read this book towards the tail end of last year, and agree that it is a wonderful thought experiment. What I found fascinating is that there are places on this planet which man has abandoned already, seemingly permanently. We all know about Chernobyl, of course, but I had never thought about the Korean DMZ and knew nothing about the Greek town in Turkish Cyprus. Some of the things we are doing to this planet will last a very long time. Others are so transient as to make you feel incredibly insignificant.